Vernon Rieta's "The Red Lion Head." Vernon Rieta sees his life's work as centered on art. He's a kung fu master and teacher, a Hollywood stuntman and a painter. "I see it all as art," he says. As a child, Chinese culture played a big part in Rieta's life, and he learned kung fu at an early age. At 17, Rieta left Hawaii to go to art school in New York, then returned soon after he graduated, homesick for the islands. For three years, he studied with artists at the Academy Art Center, but the desire to practice kung fu took him to the mainland once again. When he was approached to do a fight scene for a Hollywood movie, Rieta realized he could make a better living in front of the camera than doing either kung fu or painting. So for 24 years, he worked as a stuntman. Now, semiretired, Rieta's back in the isles with his first art exhibit in 30 years. 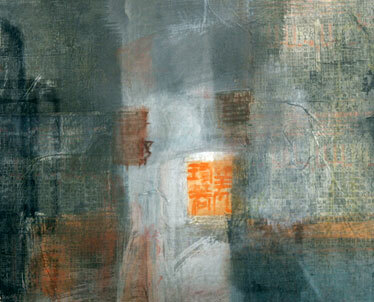 "Auspicious 8," which shows at the Louis Pohl Gallery this month, features nine large paintings. "Eight paintings plus one -- nine is a lucky number, too," Rieta says, plus 26 small-scale works. The show celebrates the lucky 08-08-08 date being noted as the most auspicious day in 1,000 years. 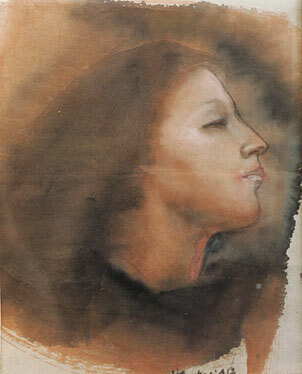 Hung Kwai Chan's "Genuine Beauty Looks Within Beauty, Kindliness." Hung Kwai Chan's "I Just Wondering ..."
IN ADDITION to Rieta's pieces, the gallery is also showing paintings by Hung Kwai Chan, a Honolulu artist whose works have been exhibited in collections and museums that include the prestigious Whitney Museum of American Art, the Honolulu Academy of Arts and the State Foundation on Culture and the Arts. 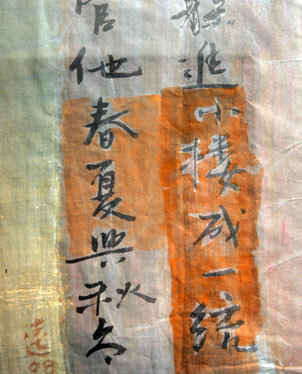 Chan's early study of Chinese calligraphy is often reflected in his current contemporary work. "I try to create a visual language with my paintings," he says in an artist's statement. "Whether it is a particular feeling, thought or image ... I try to capture it in my paintings through the mixed use of colors, the interplay of light and dark and the inclusion of figures and images." 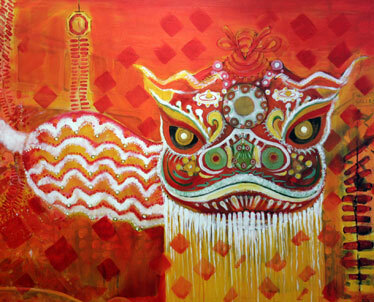 "Auspicious 8" and the paintings by Chan are on display throughout August. The Louis Pohl Gallery, located at 1111 Nuuanu Ave., is open 11 a.m. to 5 p.m. Tuesdays to Saturdays and by appointment. Call 521-1812. "Shut Yourself in a Little World and Care Less What Others Say." 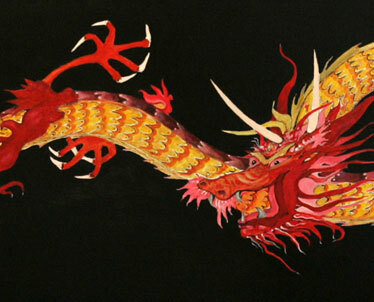 Vernon Rieta's "Dragons are Protectors and a Symbol of Success."